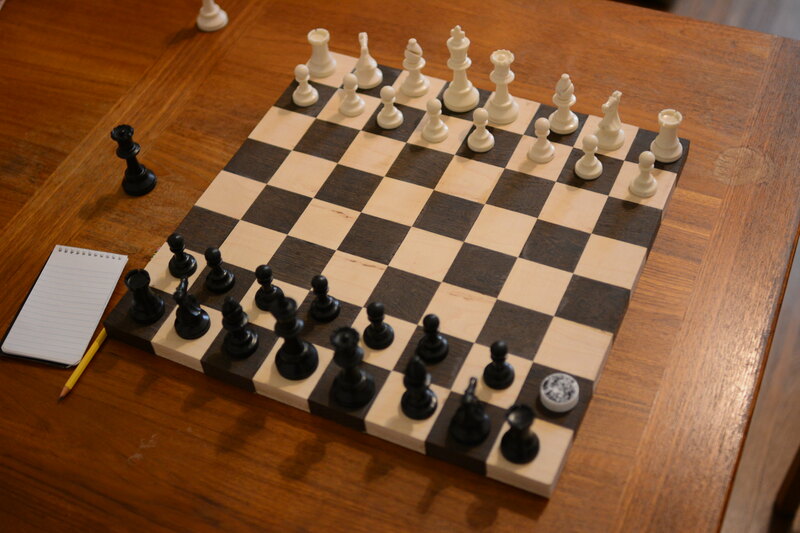 I've been getting more and more into chess recently -- a friend and I play every morning -- but we play on a crap vinyl roll-up board (this cheap one on Amazon). 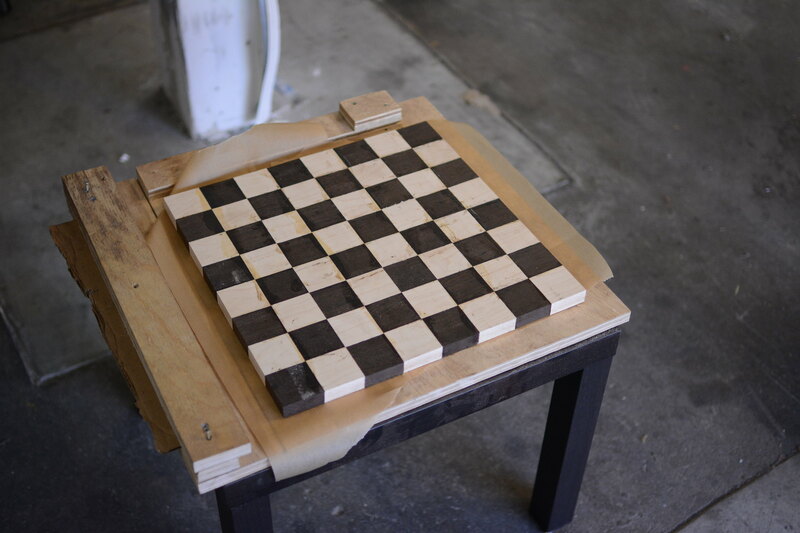 What better way to get a great chess board and scratch my woodworking itch than to make one myself? 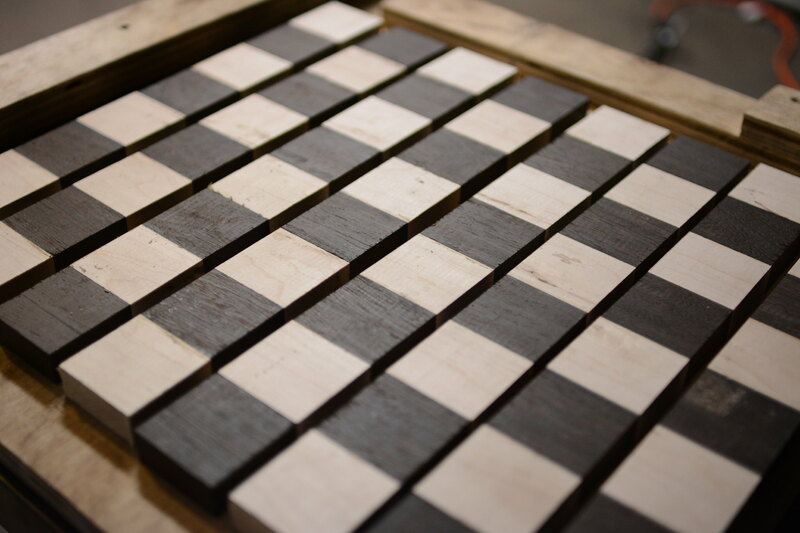 The project started with a trip to Macbeaths in Berkeley, which is an incredible exotic wood store. 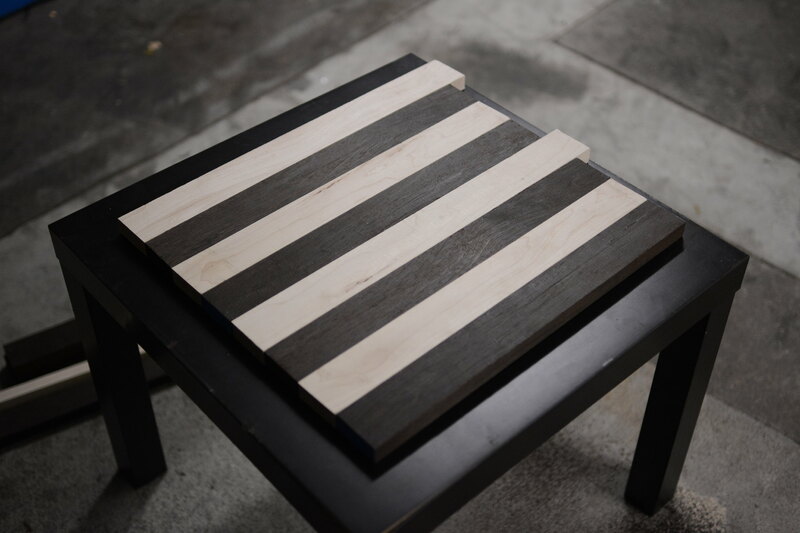 I bought two 6x1s -- one of wenge and one of maple -- and got them to rip them down to two-inch-wide pieces. They did a great job ripping the boards, which is good, since I don't have access to a tablesaw. Not having a driver's license makes getting stuff like this home kind of tricky; I ended up tying it to my bike and then taking my bike on BART. 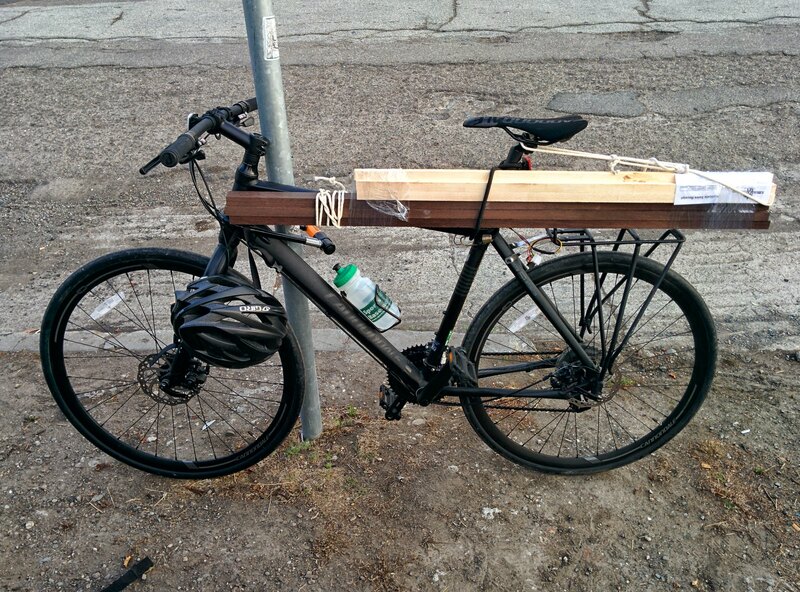 I also ended up buying a circular saw for this project, which was also tied down to the bike for transportation home. I would not recommend it. 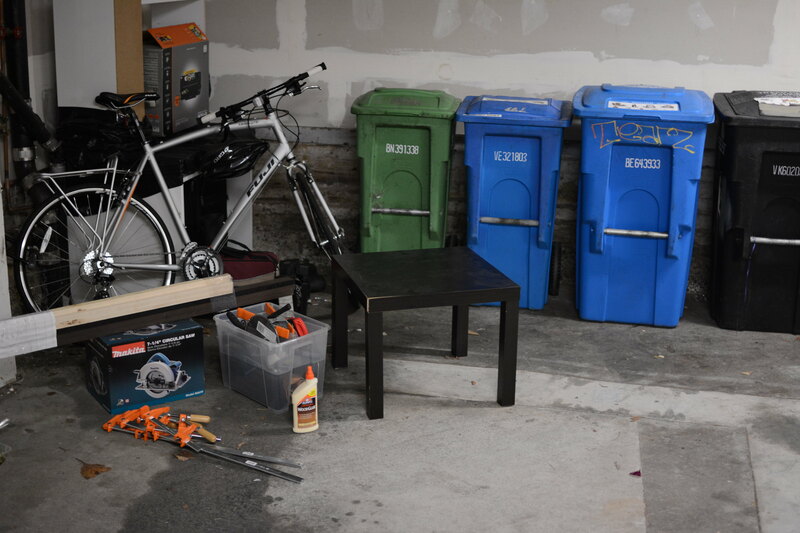 This is my first time using my garage as a workspace, so it's missing most of the trappings of a proper shop. The trash cans really tie the room together. 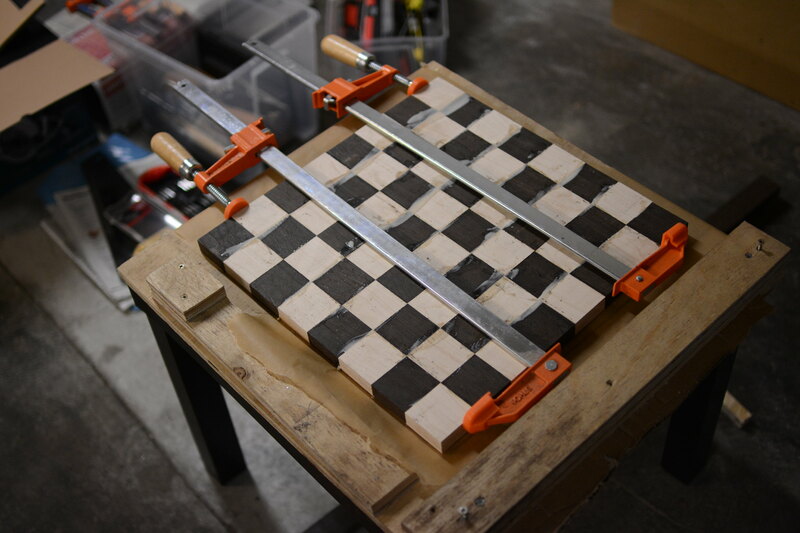 Step one was to cut the boards all down approximately to size; the pieces are all 2 1/16 inches wide, so the chess board is going to be 16 1/2 inches long. 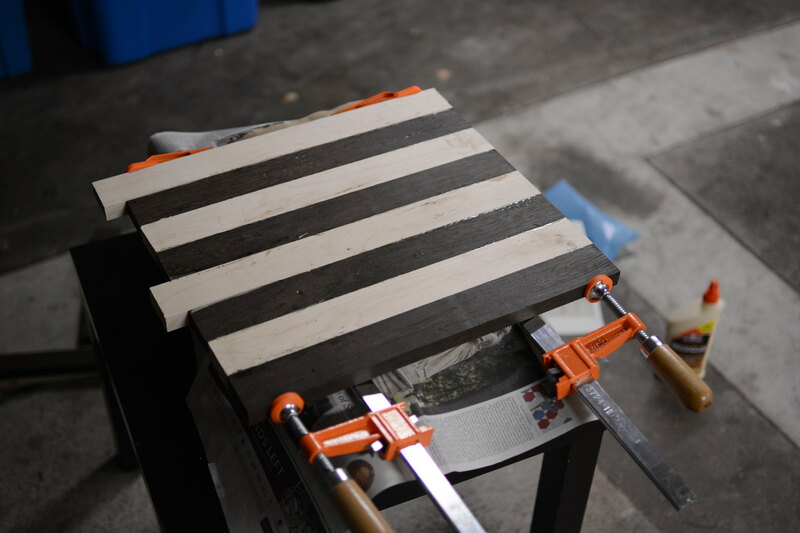 I cut lengths of 18-ish inches (the maple boards were 37 inches long, so there's two 18 inch and two 19 inch segments) and saved the scrap. 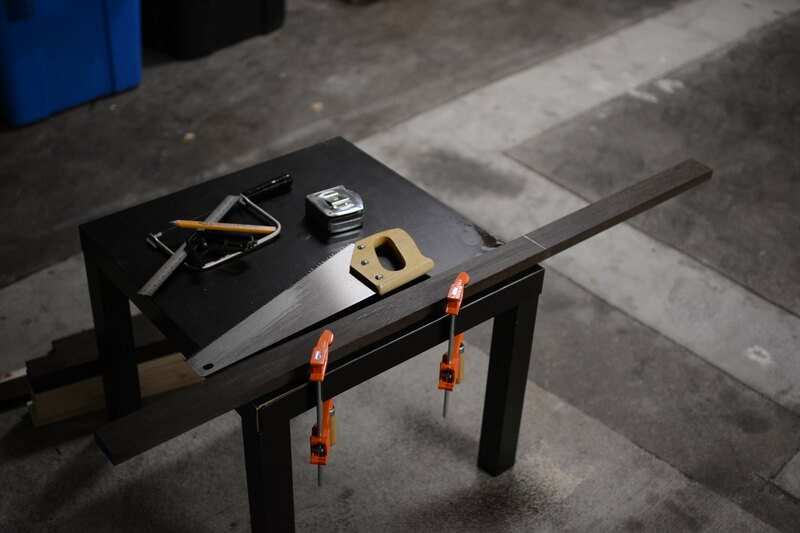 I was a bit worried the wenge would be hard to work with, but I didn't have any trouble getting through it with a hand saw. So far, so good. Once all the pieces are cut to size, I laid them all out and figured out which sides I wanted to make the front of the board. One section of the maple in particular has a pretty bad side; I want to make sure that the blemishes all end up on the bottom of the board. Next step: gluing. 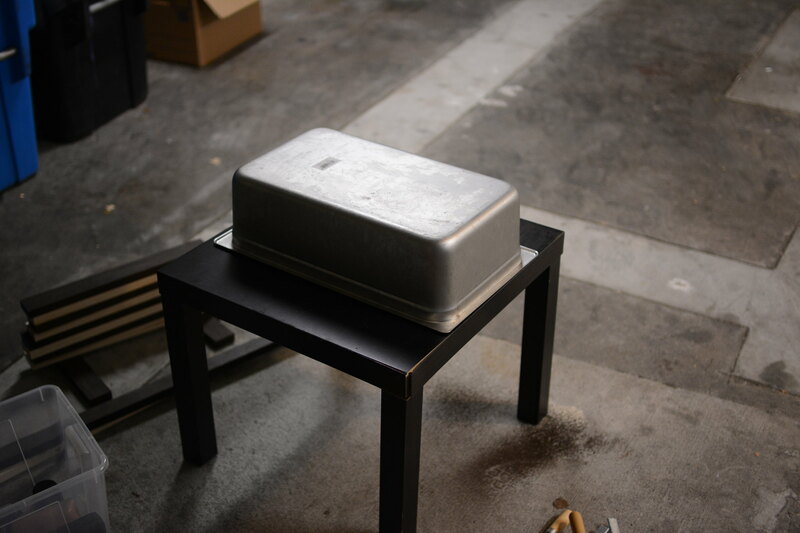 Laughably, this big hotel pan (which you might recognize from my sous vide project) is the biggest flat surface I have at home that I can get down to the garage. I need something nice and flat, because the flatness of this is going to really effect the flatness of the glued-up result; the flatter this is, the less sanding I have to do later. All glued and clamped up. There's some glue coming out of the cracks, but that's okay; the surface is going to need a lot of work anyway, and I don't mind a bit of extra sanding. The surface finish at this point is pretty crap. After the final gluing (don't worry, there's more) I'll clean all this up with some heavy-grit sandpaper. 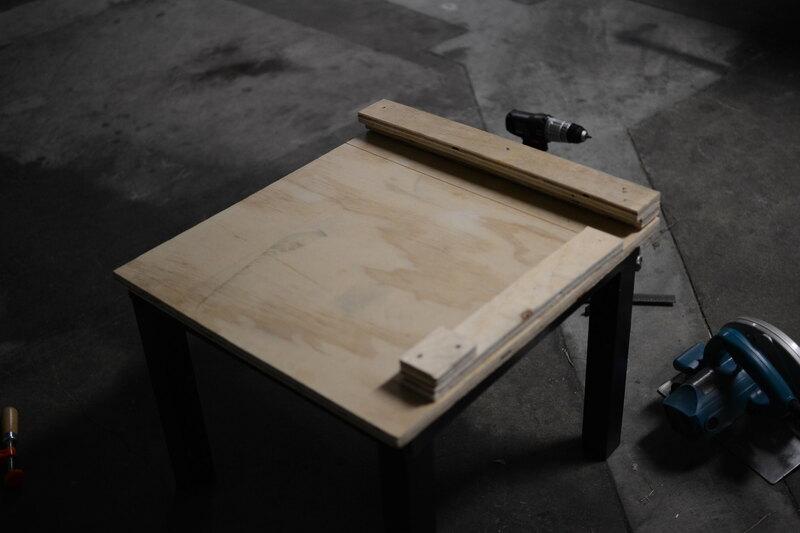 I made a jig out of scrap ply at work for cutting out 2 1/16-inch strips; I found that I could reliably cut at that width to around ± 1/16 inch, which I figure was close enough. This also helps me keep the cut edges true relative to the outer edges of the strips. In the jig, ready to saw. The clamp kept it from skating as I cut. 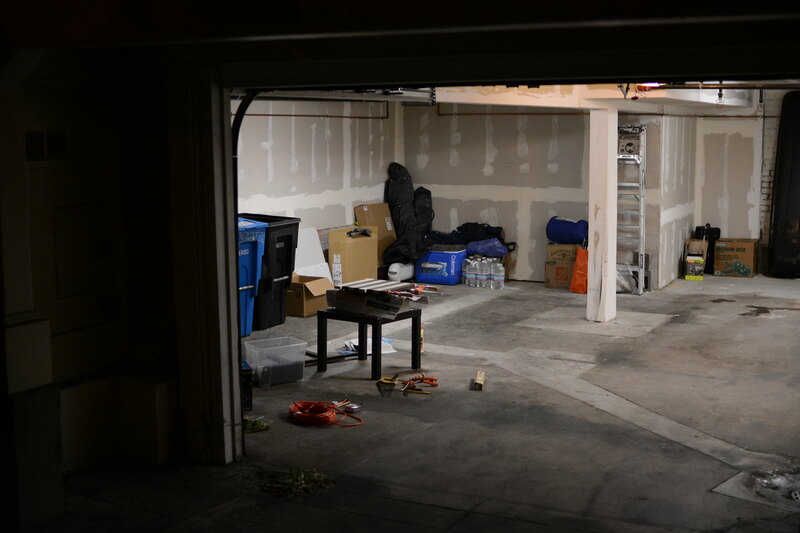 The system worked really well, in part because the overhang was so snug; even when it got too small to use the clamp, the overhang had enough friction to mostly keep the material in place. 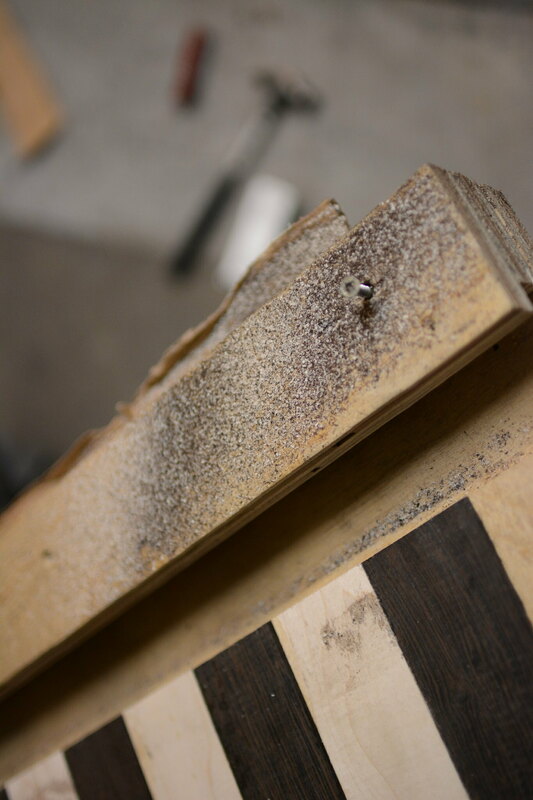 The first strip to come off was just to true up one side of the glued edges. I'll be keeping this as a stain sample. 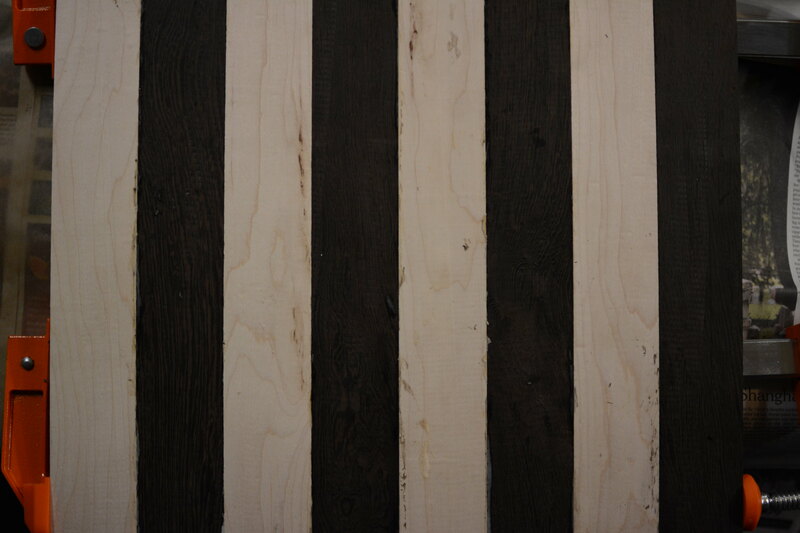 The sawdust gets put down in stripes when cutting; I thought it looked really cool. All cut up and ready for the second gluing. And glued. I later learned that I made two mistakes here: one was not wiping away the excess while it was still wet (at the time, I assumed it wouldn't be that hard to sand off. I later learn that I am very wrong). The other was to not let it dry on the hotel pan again. 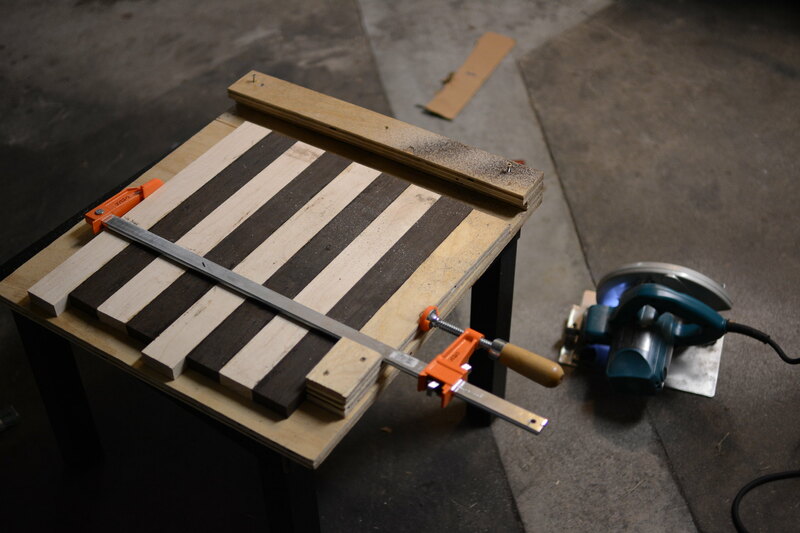 There's a really slight warp that I have to correct with sandpaper later. Day 3: sanding, sanding, sanding. Straight out of the gluing jig, and it looks really messy. Time to get to work with some sandpaper. This picture was taken after doing the first pass over the right half of the board with 36-grit paper. I end up sanding for around 3 hours. It plays! After all that sanding, Dan and I take it for a test run. 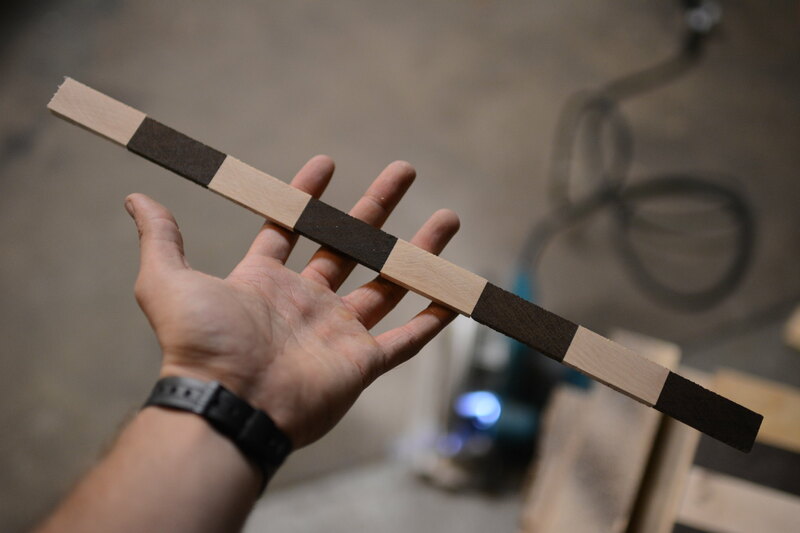 The slight warp means that it doesn't sit on a table very nicely, but the satisfying wooden sounds when you put pieces down are great, and it's starting to look nice as well. Still needs a lot more sanding.